…of everything we need to create a magical night aboard THE POLAR EXPRESS™! 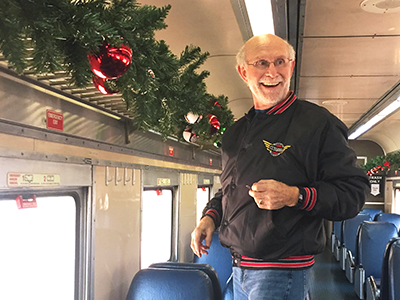 THE POLAR EXPRESS™ train ride, presented by Countertop Solutions, has been bringing magic to families in Northeast Ohio for over two decades. How does it happen? Magic, of course! Magic in the form of volunteers! 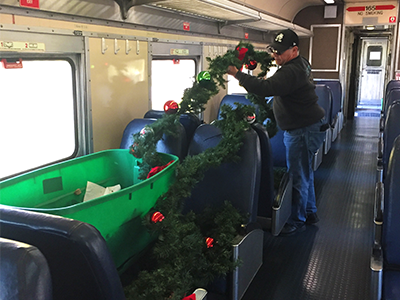 CVSR volunteers spend days decorating the stations and train cars to create a festive atmosphere, taking their time to make sure every little detail is right. 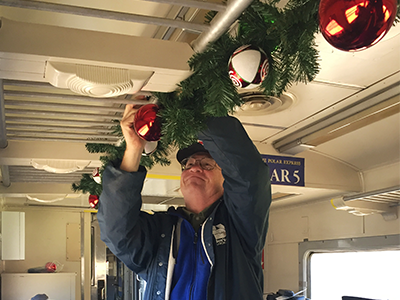 From stringing Christmas lights at the stations, to hanging garland in the train cars, THE POLAR EXPRESS™ wouldn’t be possible without the help of our volunteers. CVSR starts planning for the special Christmas ride months before, making sure the hot chocolate is the richest it can be, taste-testing the cookies for deliciousness, and double checking every string of lights! Most importantly, volunteers and staff work tirelessly to provide maintenance on the train cars, ensuring that the cars are in tip-top shape to take over 40,000 passengers to the North Pole. 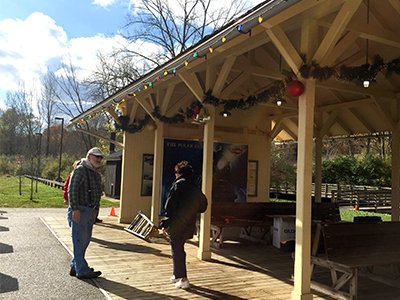 Volunteers made their way to Rockside and Akron stations to hang up garland, twinkling lights, banners and other festive decorations. 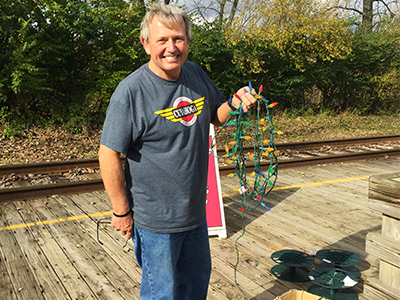 Once the stations are decked out, volunteers moved to CVSR’s train yard to tackle the task of transforming our train cars into a Christmas wonderland. 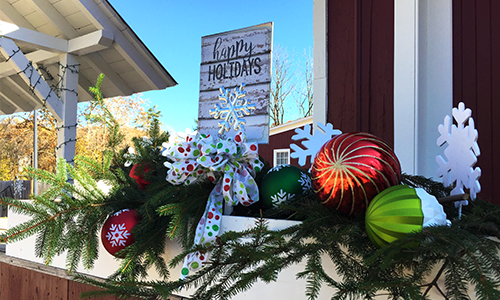 Christmas trees get assembled, garland is hung on the walls with care, and even signage is covered with THE POLAR EXPRESS™ decorations. An audio crew triple checks all the speakers on board each train car, ensuring passengers can hear the magical book and soundtrack from the movie. The concession car is filled to the brim with popcorn, candy and tasty beverages (extra coffee too). THE POLAR EXPRESS™ merchandise like stuffed animals, snow globes, ornaments, and more are loaded onto the train cars awaiting a home. We can’t wait for 40 nights of pajamas, hot cocoa, Christmas carols, and dancing elves at the North Pole! Are you ready to climb aboard for THE POLAR EXPRESS™? Tickets for THE POLAR EXPRESS™ train ride are sold out. If interested in being a part of the event click here.